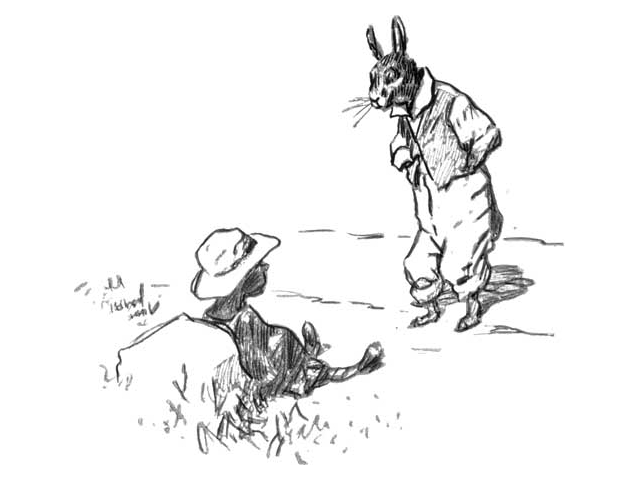 Brer Rabbit meets the Tar Baby – from original drawing by E.W. Kemble in The Tar Baby by Joel Chandler Harris, 1904 Hawthorn Books. Yes, tar sands crude sells at a discount south of the border. Not because there are no pipelines to get it there, but because refineries now have ample supplies of fracked ‘light tight oil’ or ‘shale oil’ produced right in the USA. If I were a refinery operator in Texas, and had to choose between that Canadian glurp, and ‘light, sweet LTO’ (that’s what IEA calls shale oil), I too would demand a lower price from my good Canadian friends. Someone needs to explain to Peter Kent, Joe Oliver, Stephen Harper and Alison Redford that Athabasca’s tar sands bonanza has become something people want to avoid. It is now Canada’s tar baby. The discount price is likely to continue, because the fracking technology that liberated shale oil can be applied world-wide further increasing the supply of LTO. So, where does this leave Keystone XL, Northern Gateway, Kinder Morgan’s Trans Mountain pipeline and any other new export systems the Harper and Redford governments are pushing so hard on? Why are all these pipelines suddenly needed, and what good or harm will they do? To answer that question, let’s step back and think about environment and economy. In Avatar, James Cameron has depicted an epic struggle between the humanoid Navi, who live sustainably on their planet, Pandora, and a human colony bent on mining its resources and exporting them. That they will destroy the ecosystem that sustains Pandora is not their concern. Canada is an enormous country, rich in natural resources. 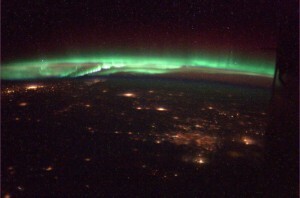 Canada could be Pandora, and Canadians could choose to be Navi, deciding to become good stewards of this fine land as our First Nations used to be, or we could decide to continue to be plunderers, treating our nation as an enormous storehouse of items that we can pick up, dust off, and ship out to happy purchasers around the world. We Second Nation types began as plunderers, sailing across from Europe each summer to scoop up cod and take them home with us, or later paddling through the land, purchasing furs for a few beads or a blanket, and shipping them home at great profit. And we have continued as plunderers. Far too often, we focus on extraction of raw materials that we sell to others after minimal processing instead of using them to create value-added products that we then sell to others. Indeed, our prevailing approach these days is to invite foreign plunderers in, offer them favorable terms, allow them to do the extraction and minimal processing, employing a few of us along the way. As a consequence we remain hewers of wood and drawers of water, despite the fact that the quality and general level of education of our workforce ranks very highly in comparison to other nations. We could, and should aspire to a technologically more advanced economy, and the high standards of living such an economy could bring. In developing the tar sands, we have welcomed the multinationals, including state-owned companies like Nexen, charged them modest royalties and favorable tax regulations, and allowed them to dictate our environmental policies. The funds generated from royalties and taxes have been used to mask our otherwise fragile economy and the tar sands jobs have been held up as signs of the success of this approach. The environmental costs have been hidden, denied, downplayed and dismissed, and anyone daring to question the wisdom of the rapid ramp-up in production has been accused by the Harper government of being anti-capitalist, socialist, radical, obstructionist, or a traitor. We are acting as typical plunderers. Nothing intrinsically wrong with tar sands oil? In my view, there is nothing intrinsically wrong in attempting to harvest the hydrocarbons stored in the tar sands, nor in welcoming foreign investment to help develop this component of our economy. There is not even anything intrinsically wrong in being a net exporter of fossil fuels as Canada has been for many years. But there is something morally wrong in encouraging a very largely foreign-owned industry to grow as rapidly as possible, when environmental safeguards are not in place (and in some cases have not yet been invented), when the government revenue gained is frittered away rather than being invested in building a technically more advanced economy, and when very few compensatory steps are being taken to address the pollution being caused. That the Harper government is currently spending millions of dollars to promote the tar sands – in travel, in lobbying foreign governments, and in producing and screening slick advertisements to convince Canadians that this is all in our collective best interest – makes the dubious morality very troubling indeed. The Vancouver Observer recently estimated this advertising program at $16.5 million of our tax dollars! When I say there is nothing intrinsically wrong with developing the tar sands, I have some caveats. The world currently uses hydrocarbons for the bulk of its energy needs, and the transition away from these to less environmentally damaging fuels will take some time. During this period when hydrocarbons are in demand, Canada is entitled to enter this market as a supplier. No society has ever existed that does not use natural resources, and using same can be fully compatible with a sustainable environmental policy. Ethical use of the tar sands would require that extraction and processing are done sustainably, or, if not, that a sizeable portion of profits is used to move towards sustainability before rates of production are significantly increased. Ethical use would also require that the nation is taking significant steps towards a carbon-free economy, with a minimal goal of reducing CO2 emissions in other sectors to fully compensate for the increased CO2 releases due to the tar sands program. Ethical use would require that the tar sands industry is viewed as a short-term activity, to be wound down long before existing reserves are gone, rather than as the primary driver of our economy for years to come. Unfortunately, while the Harper government tried to sell the world on ‘ethical oil’, none of these requirements are being met. 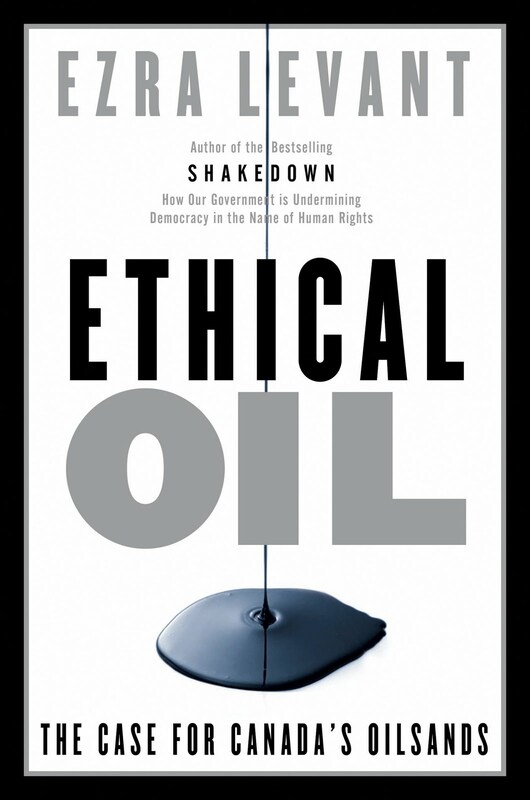 There is a difference between ethical use and ethical oil! What are the environmental costs of tar sands development? And what portion of these costs is being borne by the multinational corporations that are growing this business? 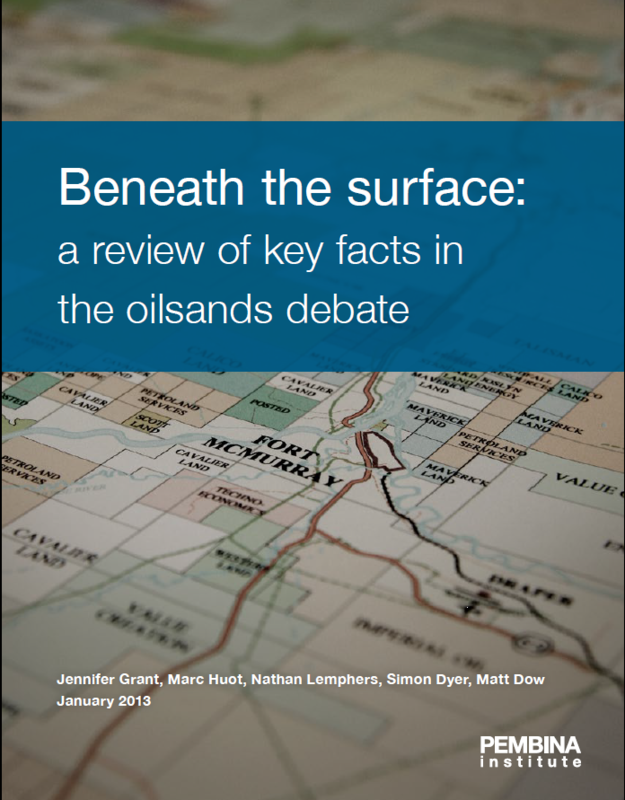 In January 2013, the Pembina Institute released ‘Beneath the Surface. 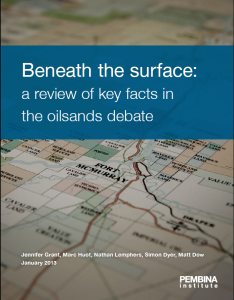 A review of key facts in the oilsands debate’. Much of what follows comes from it, but it is worth reading in full. 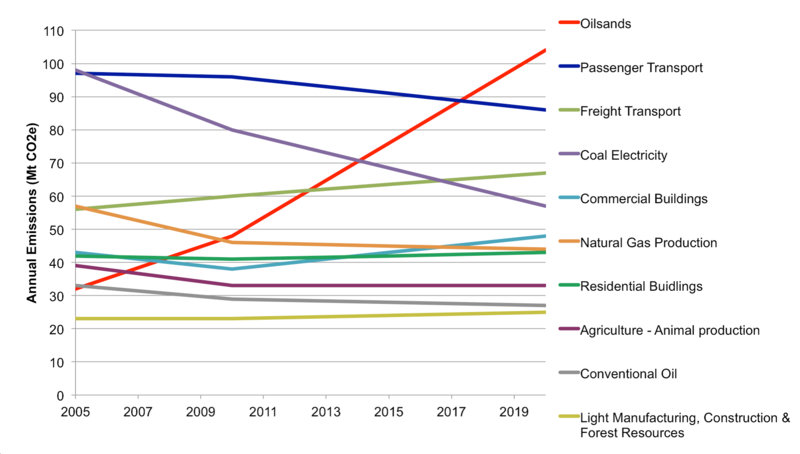 One problem in assessing the environmental footprint of this industry is that it has been growing so rapidly that the footprint is constantly changing. For example, in late 2012, tar sands production was about 2.3 million barrels of crude per day, but construction of new projects, and approvals awaiting construction could soon bring this total to over 5.2 million barrels a day, all produced using current technology – i.e. less expensive, more polluting technology than that likely to be developed over the next few years. While there is much to say about the polluting effects of current tar sands production, the rapid growth ensures that future impacts are going to be a lot larger. It takes energy to harvest fossil fuels and tar sands oil is particularly difficult to extract and upgrade (refine it to the point that it will flow in a pipeline). The per-barrel greenhouse gas emissions associated with tar sands extraction and upgrading are currently estimated to be 220 to 350 per cent (3.2 to 4.5 times) higher than conventional crude oil produced in Canada or the United States. The energy costs of transport, refining, and final use are comparable to those of other heavy oils. 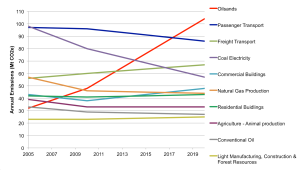 The growth of the industry means that the total CO2 emissions are also growing substantially. Since 1990, total emissions have nearly tripled to 48 Mt (million tonnes) CO2 in 2010, and could grow to 104 Mt CO2 in 2020. This is so despite some slight improvements in emissions per barrel achieved in the 1990s – emissions are now about 90 kg CO2 per barrel, and there has been no further improvement since 2001. Despite some reductions in the rate of emissions per barrel of oil, total emissions of CO2 per year continue to grow because the industry is growing. These emissions DO make a difference. I have written previously about Canada’s failure to make progress towards its 2020 target for reducing emissions of greenhouse gases (GHG), and about the persistent claim by the Harper government that we are halfway there, when in fact we are actually going to fail to meet the target by 50% in 2020. 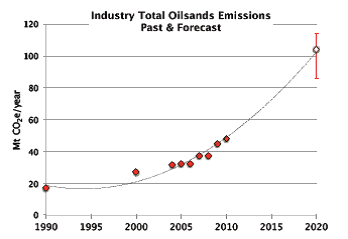 In the decade between 2010 and 2020, emissions from tar sands production are expected to increase by 56 Mt CO2, largely wiping out the gains being made in some other sectors (due, incidentally, mostly to policies of governments other than the Harper government). Canada should be capable of doing much better than this. The Harper government and the industry have both been quick to point out the small proportion of emissions due to Canada’s tar sands program – its emissions represent just 1/600th of total global emissions. This misses the point. This 1/600th makes Canada’s tar sands a larger contributor to climate change than the entire country of Portugal, or 86 other countries among 142 compared. And Canada, as a result, has one of the highest per capita emissions rates on the planet. Our poor performance is partly due to the tar sands industry, and definitely a major contributor to the continued growth in CO2 in the atmosphere, and to the likelihood that the world community is going to fail to bring climate change under control. 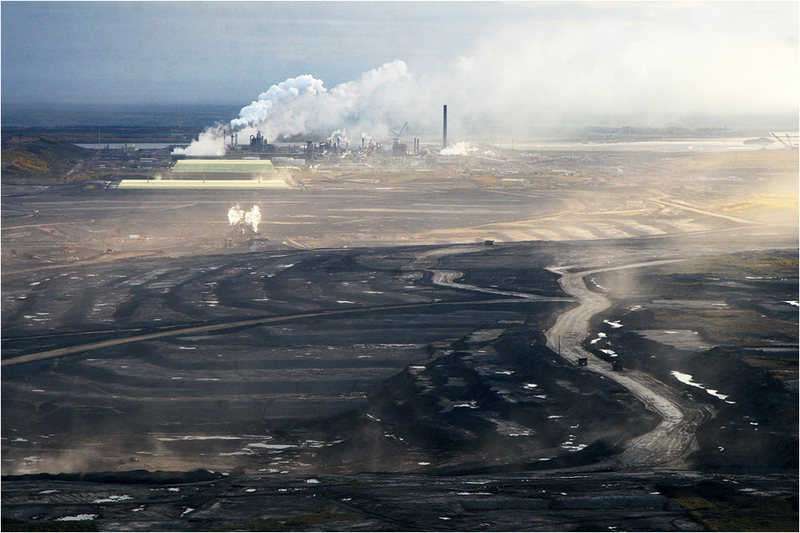 CO2 pollution is not the only way in which the tar sands industry is impacting the environment. The Pembina report documents the poor air quality in the Fort McMurray region, the growing frequency of air quality measurements that exceed allowable limits, and growing problems with nitrogen dioxide (NO2), sulfur dioxide (SO2), hydrogen sulfide (H2S), and ozone (O3). Indeed, NO2 levels throughout much of the tar sands region (an area the size of England) will grossly exceed permitted levels of this pollutant once all approved projects are on-line unless substantial mitigating technologies are introduced. And then there is water pollution. Perhaps the largest environmental threat beyond climate change is the impact on water; tar sands projects are having major effects on water quality in the Athabasca River drainage system, while also sequestering vast quantities of contaminated waters permanently in end pit lakes. Contamination of the waterway comes in two ways – aerial deposition of substances released at upgrader (processing) plants and from open pit operations, and seepage from end pit lakes and other tailings ponds. The extent of this pollution was initially unknown because monitoring of the waterways by the Alberta government was inadequate. Not finding evidence of pollution is not proof that the pollution is not there, and inadequate monitoring programs are predisposed to fail to find problems. We would probably still be being assured by Alberta government scientists and Environment Canada that the industry was not causing significant changes to the quality of the Athabasca River system, if it were not for the fact that Canada has some excellent aquatic scientists in its universities. David Schindler of University of Alberta has been the most vocal, but he is far from alone, and the data Schindler and others obtained, and published in quality peer-reviewed journals like Science, forced a 2011 review of the official governmental monitoring program (and found it inadequate). In February 2012 a joint monitoring program by Alberta and Environment Canada was announced, and results are trickling out. I commented recently on the new web portal that gives anyone a dump of raw data from this program – it remains to be seen if the two governments are going to undertake this job responsibly, or continue the practices of the past, hoping to find nothing and spinning frantically whenever bad news appears. I’ve also commented on some of the studies that have appeared in scientific journals – the major problem is increased concentrations of polycyclic aromatic hydrocarbons (PAHs), due primarily to air deposition. PAHs are highly toxic chemicals that affect a wide range of organisms as well as humans, and break down very slowly in the natural environment. The data suggest their concentrations in water bodies in the region have increased as much as 23-fold since 1960, and evidence of impacts on fish has been seen. Not really the kind of contaminant one wishes to see accumulating in the major watershed of northern Alberta, a river originating in the Columbia Icefield high in the Rockies, that drains into Great Slave Lake and thence via the Mackenzie River system to the Arctic Ocean. Tar sands extraction also uses lots of water, and current technology does not permit this water to be cleaned and released back to the watershed. Open pit operations dig out the tar sands and transport them to upgraders where steam and various chemicals are used to heat it sufficiently for the bitumen to flow out and be collected. The amount of water used depends on the quality of the bitumen and the recycling efficiency of the plant, but can vary from 7.5 to 12 barrels of water per barrel of oil produced. By recycling between 40 and 70% of this water back into the process, the net use is reduced to 2 to 4 barrels per barrel of oil. On each cycle some of the water (2-4 barrels per barrel of oil) remains in the pore spaces of the mineral sand, clay and silt left over after the bitumen has been extracted. This slurry of tailings has to be stored indefinitely because there is no technology available to clean it. In situ operations do not dig up the tar sands. Instead wells are drilled and steam and various chemicals are injected under pressure to heat the bitumen in situ causing it to flow towards the well, from where it can be pumped to the surface. These operations use less water – from 0.8 to 1.7 barrels of water per barrel of oil produced, and a portion of this is groundwater, rather than surface water. In these operations however the typically brackish groundwater and fresh surface waters become mixed with process chemicals and contaminants in the tar sands, and much of the water injected comes back to the surface with the oil. There is an approximately 90% recycling rate, but again, significant quantities of contaminated water are left to be stored indefinitely. In 2011, total use of water in tar sands production and upgrading was 150 million m3 per year, of which 28 million m3 was for in situ projects. While efficiencies of open pit operations have increased, and in situ operations are a growing proportion of production, the anticipated growth in production means that use of water must rise above 150 million m3 per year in the future. This water comes from the Athabasca River drainage and regulations governing how much water may be taken are weak. The Athabasca River Water Management Framework sets mandatory limits on withdrawals at no more than 3% of average annual flow per year. Current use amounts to about 1% of average annual flow, but this amount represents a doubling of use over the last decade. While these numbers sound good (and have been used by Joe Oliver, Minister of Natural Resources, as evidence of wise environmental management), they ignore the 10-fold fluctuations in flow that the Athabasca River experiences annually, and they lack a specified EBF, an ecological base flow rate. The EBF is the minimum rate of flow that must be sustained for a river system to maintain its ecological integrity – flows less than this lead to development of low oxygen conditions with consequent impacts on fish and other organisms. A responsible water management plan would regulate when water can be removed as well as the total amount per year, and would prohibit any removals that reduce flow below EBF. 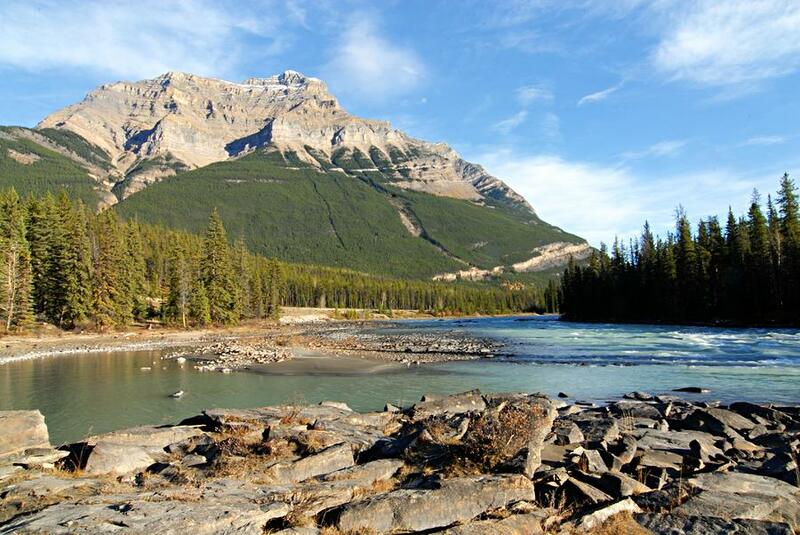 Climate change is going to reduce average flows in the Athabasca River (because of its effects on glacier melt), making the future situation more critical than is currently the case, but there are no publicly known plans to strengthen management of use of this waterway. The storage of tailings waste – the heavily polluted process water – perhaps best reveals the impacts of tar sands mining on water. Beneath the Surface reports that for the first 40 years of operations there were effectively no regulations governing the storage of these tailings. As a result vast lakes (they are far too big to be called tailings ponds) of polluted water accumulated across the landscape. In February 2009, the Alberta Energy Resources Conservation Board issued Directive 074 with aggressive criteria for managing tailings, but the directive is not being enforced and most operations are not in compliance with it. In 2009, 720 million m3 of tailings were being stored in lakes covering 130 km2. Nine operations submitted tailings management plans. Two were in compliance with Directive 074, but the plans of the other seven were accepted – evidence of effort to meet the requirements seems to be all that is required. By 2010, tailings lakes had grown to cover 176 km2 and tailings volume had grown to 830 million m3. By 2030, this volume is expected to increase 40% to 1.2 billion m3. 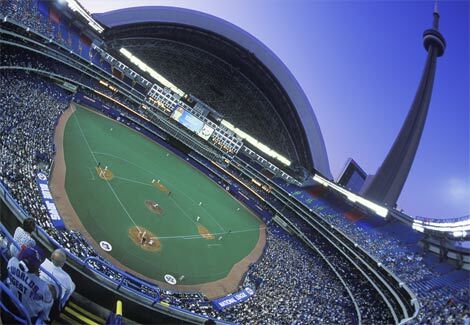 The rate of generation of tailings is now sufficient to fill Toronto’s ‘Sky Dome’ Rogers Centre 47 times a year – that is a lot of seriously polluted water. Enough tailings produced each year to fill the Sky Dome (Rogers Centre) 47 times! CAPP, the Canadian Association of Petroleum Producers, describes tailings as “the leftover liquid mixture of mostly water and clay, some sand and residual oil”. Sounds pretty tame. They fail to mention the heavy metals, PAHs, naphthenic acids, and solvents added to the bitumen during processing. These are toxic wastes that can kill organisms that happen to fall into the lakes. Naphthenic acids, for example, cause tailings to be acutely toxic to aquatic organisms, yet tailings lake waters can contain more than 100 times the natural levels in northern Alberta waters. Existing water quality standards for Alberta do not set any limits for naphthenic acids. The millions of m3 of tailings are held in artificial lakes, often behind dams, and they are to be held indefinitely. Dams sometimes fail and tailings ponds can seep slowly into groundwater or through retaining dam walls. What about seepage from the tar sands tailings lakes? Nobody knows for sure, although operators have been required to estimate likely rates. One estimate, by Total E&P Canada Ltd, for the total seepage into the Athabasca River drainage system was 12.6 thousand m3 per day in 2013, rising to 23.9 thousand m3 per day in 2044. As for the tailings that do not seep out of the lakes, plans are sketchy at best. The fact is that tar sands mining operations have stored contaminated tailings in lakes without any proven plan for eventual remediation, and governments have allowed them to continue to do this for decades. At present, the preferred option for rehabilitation depends on slow settlement of heavier contaminants which can then be removed and disposed of somehow. Then as a second step, clean water will be used to cover the remaining tailings waters in the hope that viable biological communities will develop in the upper layers while the denser, toxic tailings waters will sit quietly below. Late in 2012, the Alberta government gave the go-ahead for Suncor to undertake a trial of this remediation procedure. The trial is expected to take decades to run. It is unclear to me what will be done if the trial shows the process does not work. Vast quantities of seriously contaminated water are accumulating assuming this untested process will work. And this brings me to the final part of this story. Given all this environmental damage, how, and how effectively will the environment be remediated, and who will pay the cost if remediation proves difficult? The environment of northern Alberta is a land of wetlands and river systems interspersed with regions of boreal forest. Government regulations do not require the tar sands operators to restore the land, but only to reclaim it. There is an important distinction here – the expectation is that the land will support viable ecosystems, not necessarily the ones it previously sustained. Never mind whether the problem of tailings lake toxicity can be solved. Government-sanctioned reclamation plans will lead to a place of large lakes with contaminated deeper layers interspersed with forest. The extensive peat wetlands will be gone, and the forests will not resemble the boreal forest they replace. And nobody really knows when this ‘recovery’ of the environment will take place or whether it can even be done. To date, Syncrude’s Gateway Hill, a former overburden dump site, has been revegetated and certified reclaimed, and Syncrude’s Wapisiw Lookout (Tailing Pond #1) has been reclaimed to ‘industry standards’. These represent 0.1% (1.04 km2) of disturbed land, and 1% of total tailings lake area in the region. The lake was ‘reclaimed’ by pumping the tailings water into other lakes, then filling in and re-vegetating the hole left behind. Since 2009, Alberta has had in place restoration guidelines to encourage reclamation. Projects that fail to achieve the rates of reclamation required must pay a modest deposit ($75,000 per hectare), but they can use tar sands reserves rather than cash for this purpose. 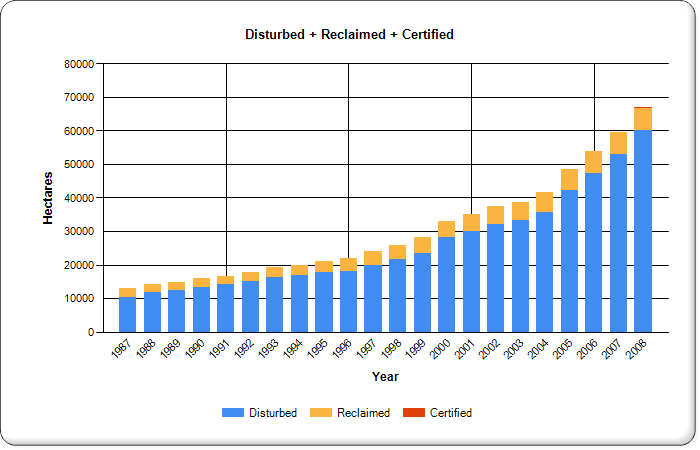 Rates of disturbance and reclamation of land in the tar sands region. Graph © Environment and sustainable Resource Development, Alberta. The slow pace of reclamation, the unproven reclamation methods, the lax enforcement of the few regulations that exist all conspire to do one thing – allow the operators to mine with little regard to restoring the environment in the future, and without even a requirement to post a significant bond to be used to pay for reclamation in the event the operator goes out of business or walks away. Indeed, at the end of the tar sands boom, the public could be left with a massively contaminated environment and title to some now worthless tar sands reserves as payment for the mess made. Beneath the Surface convinces me that the entire development of Alberta’s tar sands has been facilitated by governments overly anxious to court interested multinational corporations, seduced by the possibilities of construction jobs and tax and royalty revenues, and therefore happy to be as compliant as possible when regulating the behavior of the operators. And the operators, as good corporations always do, have operated at the edge of, or just beyond, whatever regulations were in place, thereby maximizing short-term profits for their investors, and with no clear plans for how they will close down once the boom is over. This is not a story that seems likely to end well for Canada. The unsolved difficulties in reclamation are one reason why there is such a strong push right now to build new pipelines. Keystone XL, Northern Gateway, Kinder-Morgan’s Trans Mountain scheme, and even an un-named scheme to build a pipeline north to the Arctic Ocean are all part of a desperate plan to keep the boom times going. If the industry continues to grow, the jobs, royalties and taxes will continue to flow. The tar sands will look like an economic winner, and the need to show good citizenship by tidying up and cleaning up can be put off to a much later day. A second reason, I am convinced, is that the multinational operators know that they have a narrow window in which to exploit these resources. The global community is either going to wake up and demand an active transition away from fossil fuels, or the evidences of climate change are going to become serious enough to frighten us into moving away from fossil fuels. One of these outcomes will probably occur long before the Athabasca tar sands are fully exploited, so it follows that the more rapidly exploitation can be ramped up, the greater the amount that can be extracted and converted to dollars before the market for tar sands collapses. A third reason may be that the Alberta and Harper governments, by now thoroughly addicted to the short-term rewards tar sands development has been bringing, can see no way to retain political power if the tar sands should falter economically. Willing partners in ramping up this program, they have become convinced that it must grow, and for that to happen more capacity to get product to distant markets must be achieved. They have not stopped to wonder why they are not requiring that a substantial portion of the product be refined in Canada, nor whether Canada might benefit from slower growth in this sector. Instead they have become devoted cheerleaders and willing partners to a bad plan. If we step back and decide instead to aim for continuation at current levels of production, real attention to reclamation and remediation, and an active shift of Canada away from dependence on fossil fuels, none of these pipelines will be needed, and Canada’s future could look a whole lot better. If political pressure means that the pipelines are not approved, the pace of growth must slow, and just possibly the politicians will take a deep breath and rethink their long-term economic policy. If prices for Canada’s dirty tar sands oil continue to be steeply discounted relative to lighter LTO, the boom may collapse even with the new pipelines. A tar sands collapse, especially if swift, will be economically ‘uncomfortable’ for Canada, but we would survive. 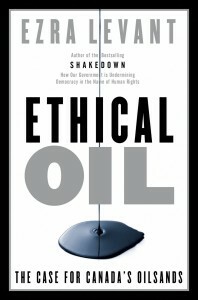 Continuation and expansion of the boom, under present regulatory policies, will be very damaging environmentally for a significant portion of the country, will leave Canada a weak petrostate on the international stage, and will leave all of us with a heavy financial burden as we try to clean up when the boom does eventually end. Tar babies can be very difficult to deal with. The development of the Athabasca tar sands is perhaps the most egregious case of a plunderer mentality operating within Canada. We have learned over many years that by harvesting natural resources and selling them cheaply, Canadians can have a good living. But there is an alternative way, and it’s one I believe would lead to a much better future. In addition to our abundant natural resources, Canada is blessed with a population of modest size and low growth, a well-educated workforce and a diverse yet reasonably harmonious social fabric. Climate change likely will be relatively kind to us, with some improvements to agricultural yields to counter the complex changes coming in the Arctic, and without the extreme desertification that will occur in many other places. If Canada was to build an economy that took full advantage of the talents of our workforce, and brought our natural resource industries to levels that were environmentally sustainable, while capturing most of the profit from exploitation by exporting only value-added products, we would begin to shift from being plunderers to becoming stewards of our land. If we went further, designing our economy so that costs of activities such as mining, including all costs of remediation following exploitation, were fully internalized in corporation balance sheets, and so that subsidies to specific economic sectors – whether mining, fishing, agriculture, manufacturing or transportation – were transparent and explicit, we would take a further giant step towards stewardship. If Canada used tax and royalty revenue from resource exploitation to fund infrastructure and the costs of shifting infrastructure to build a new, carbon-neutral economic system, we would take another giant step. And finally, if Canadians would look around them, recognize the bountiful landscape we occupy, understand that it supports ecological systems that provide a wide array of goods and services that we enjoy, and reawaken our understanding that we are each a part of this Canadian ecosystem, we would take the final giant step. We would understand that we can maintain a strong, vibrant economy and high standards of living by nurturing this Canadian ecosystem, while still enjoying the benefits it provides. We would also understand that some things buried deep in the ground are best left there, and that tar babies should not be touched.